Iranian national security can be defined in two ways: protecting its borders and maintaining the pillars of its regional influence. According to the establishment in Tehran, the use of hard power in the region can also in fact be a soft power tool that could be invested internally to gather support around the state. For example, the Iranian establishment called the 1980-1988 war with Iraq the “Sacred Defense War,” a name which aimed to interlink religion with national identity. It was also an attempt to give those who felt disconnected – due to a sense of under-representation – a reason to engage with other members of society with regards to supporting the war, rather than the government at the time. “Military experts” who went to Syria to fight alongside the Syrian army, Lebanon’s Hezbollah, and later pro-Iranian militias from Iraq, Afghanistan, and Pakistan were called “Defenders of the Shrine.” This name referred to a religious symbol of high importance to most Iranians – the tomb of Zeinab, who was the daughter of Ali, Shia Islam’s first Imam and the granddaughter of Prophet Mohammad. The “Defending the Shrine” rhetoric recalled memories from Shiite history, which was enough to portray the intervention into Syria internally as an inevitable sacred war to preserve Shia Islam’s iconic symbols who were oppressed 1,300 years ago, rather than a war to defend the Syrian President or his regime. Doing so did not only help with gaining support from grassroots movements in Iran, but also enhanced Iran’s position in the Shiite world as its main defender against the takfiris i.e. Al Qaida and ISIS. Extremist groups such as these raised anti-Shiite slogans and launched attacks on Shiite communities, calling themselves a “front” to “support” a repressed Sunni from its Alawite and Shia enemies – represented by the Assad regime and Iran, respectively. For Iran, the fall of Assad’s regime was not tolerable at any cost. The fall of Assad would mean compromising Tehran’s influence in both Syria and Lebanon where its ideological ally, Hezbollah, has built an advanced base on the borders with Israel and is regarded by the latter as a serious threat to its national security. In other words, Iranian leaders believed that the fall of Damascus could strip Tehran of its status as a regional power and could limit both its access and effectiveness on the front with Israel, which it views as its main enemy in the region. The Israeli hazard to Iran would increase in such a situation and Iranian deterrence capabilities in the case of any Israeli military action would be questionable. While the Syrian component is vital for all of the above, Iraq is a different issue when it comes to Iran’s regional security. Up until the US invasion of Iraq in 2003, Iraq was a hostile environment for Tehran. Iraq continued to be forbidden territory for Iranian influence – even after the normalization of ties that followed the Iran-Iraq war. Iraqi President Saddam Hussein ruled with an iron fist and limited any foreign access to the country’s political, social, and economic arenas. Therefore, the fall of Saddam Hussein was good news for Iran, as it provided Tehran with an opportunity for unprecedented leverage in the region through its Shiite allies in Iraq, who at the time were Washington’s main tools to fill the power vacuum in the war-torn country. Iraq was a country of shared influence; Iran invested in groups fighting US occupation for years, backed and financed other groups in Iraq, and was the main ally of the ruling Iraqi Da’wa Party. At the same time, the US had limitless powers, first as a kingmaker in Iraqi politics, and second as an occupation force with limitless powers. A turning point for Iran in gaining more influence in Iraq was when ISIS first entered Mosul, and encountered no significant resistance from the Iraqi Shiites. The Iranian border was only 40 kilometers from ISIS-controlled areas, which created another challenge for the Iranian establishment as it was already immersed in the unending war in Syria. The decision to intervene in Iraq was taken quickly by Tehran and thanks to the fatwa issued by Iraq’ highest religious authority, Ayatollah Ali Sistani, who called on Iraqis to take arms and wage holy Jihad against ISIS, the threat was transformed into an opportunity. The unprecedented fatwa by Sistani paved the way for the formation of the Popular Mobilization Units (PMU), known as Al Hashd Al Shaabi. This saw tens of thousands of Iraqi volunteers mobilizing under the direct command of two of Iran’s loyal allies in Iraq – Badr Organization leader Hadi Al Ameri and Abu Mahdi Al Mohandes, the man who is believed to be the closest to Iran’s Islamic Revolutionary Guard Corps (IRGC) commander Major General Qassem Suleimani. Iranian leaders believed that the fall of Damascus could strip Tehran of its status as a regional power and could limit both its access and effectiveness on the front with Israel. The predominantly Shia PMU – backed by Iran and its main regional arm, Lebanon’s Hezbollah – succeeded in retaking large areas of the Iraqi provinces of Diyala and Saladin from ISIS in just under one year. However, the US’ role in the war on ISIS had its effects on Iran’s strategy, mainly with regards to the red line drawn by Washington over the participation of the PMU in operations in Sunni-dominated areas such as Tikrit, Fallujah, and Mosul. The Iraqi government, led by Prime Minister Haidar Al Abadi, was stuck between accommodating his country’s two “rival allies” while at the same time ensuring that the liberation of ISIS-controlled areas continued. At the onset, Iran and the PMU tried to revert Washington’s red lines; it was ultimately clear to all parties that despite the US alliance’s airstrikes, there was no alternative but to depend on the Iranian-backed units to advance. This dilemma caused the delay of many crucial battles, yet the lack of reliable ground forces left both the US and the government in Baghdad with no other option but to accept the reality that Iran and its allied units were going to play a vital role in retaking Mosul. The main pillars of the Iranian strategy on the Iraqi-Syrian border were the Iraqi PMU on one side, and the Syrian army and pro-Iranian militias on the other. A major breakthrough in June 2017 achieved by the regime in Iran and its allies was crossing a major US red line by advancing to the border. The US tried to prevent this from happening by striking the troops, yet this did not deter Iran and their allies from advancing and opening up a vital supply line for Iran-backed militias between Syria and Iraq, thereby heralding a new regional reality. On 18 June 2017, the IRGC launched a missile attack from Iranian territory on ISIS positions in the Syrian province of Deir ez-Zour in retaliation to the 7 June 2017 twin attacks in Tehran that saw 12 Iranians killed and several injured. The attacks – which were claimed by ISIS – struck two symbolic monuments in the Iranian capital: the parliament and the tomb of the founder of the Islamic Republic, Ayatollah Rohollah Khomeini. Tehran blamed Saudi Arabia for the attack, especially after the Kingdom’s heir vowed to transfer the battle to Iran a few months prior to the attack. These incidents came as ISIS’ status was fading in Iraq and as the whole region was preparing for the post-ISIS landscape. The challenges of this period are mainly political in nature for Iran, given Iraqi Prime Minister Al Abadi’s political positioning which was perceived by allies of Tehran as unfriendly. This was the case especially with regards to the differences he showed towards the PMU, his clear keenness to establish good ties with Saudi Arabia, and the ongoing cooperation with Washington. Al Abadi visited Saudi Arabia in June as part of a regional tour that took him to Kuwait and Iran. In Riyadh, the Iraqi leader and his Saudi hosts said they had made a “qualitative leap” in their bi-lateral relations. In Tehran, Khamenei warned the Iraqi Prime Minister not to trust the Americans in their fight against ISIS, as “they and their regional allies (Saudi Arabia) have created Daesh with their money and do not wish to fully eliminate them” in Iraq. It is true that Iran wants to see Iraq as a full-fledged member of the “Resistance Axis,” yet this does not mean that they are dismayed with Baghdad’s attempts to open links with its regional neighbors. Nevertheless, they want this to happen within the framework of full coordination to block any Saudi attempts to invest in the Iraqi political arena, just months before the forthcoming general elections. The main pillars of the Iranian strategy on the Iraqi-Syrian border were the Iraqi PMU on one side, and the Syrian army and pro-Iranian militias on the other. On 31 July 2017, prominent Iraqi Shiite cleric Muqtada Sadr paid a surprising visit to the Saudi port city of Jeddah to meet Saudi Crown Prince Bin Salman, and later visited the United Arab Emirates to meet its de facto ruler, Mohammad Bin Zayed. These consecutive visits took Tehran by surprise, despite the fact that Sadr is known for distancing himself from the Iranians. Concerns in Tehran grew that their main regional rival was starting to play directly in its backyard and investing in Shiite groups, rather than just Sunni movements and secular Shiites. One main ally of Tehran in Iraq, Ammar Al Hakim, decided to resign from the leadership of the Islamic Supreme Council and form a new party called the National Wisdom Party. Al Hakim’s move was seen as an attempt to reposition himself from being a close Iranian ally to a national Iraqi leader with readiness to have good ties with all regional players. In August, Iran’s Ayatollah Mahmoud Hashemi Shahroudi, the newly-appointed chairman of the expediency council visited Iraq where he met Prime Minister Al Abadi and other political figures, yet the Iranian guest was not received by any of the four grand Shiite Ayatollahs in the holy city of Najaf. It is important to note the difference between the Najaf School of Jurisprudence and the one of Iran. While the latter believes in merging religion and politics, the former adopts the notion that religion should not interfere heavily in politics. The rivalry between the two schools had implications for Iran’s ambitions in Iraq, mainly with regards to Ayatollah Sistani’s efforts to preserve Iraqi Shiites since the fall of Saddam Hussein to preserve the Shiites of Iraq from the influence of the Iranian school of thought; a struggle that is seen by many as one over the soul of Shiism. As the political dilemma continues, another developing factor has presented the Iranians with a new opportunity to restore its losses in Iraq. The Iraqi Kurdistan independence referendum on 25 September 2017 gave Tehran the opportunity to emerge as a decisive decision maker in Iraq, despite the fact that Iranian pressure on the Kurdistan Regional Government (KRG) to postpone their plans was fruitless. The common menace of an independent Kurdistan brought Iran and Turkey on the same track, providing both countries with a chance to coordinate and decide on how to confront the new status. The Iraqi government, once again, lacked and continues to lack the tools to solve this problem without regional backing. Therefore, Ankara and Tehran are expected to play a role in the process, either to convince the KRG to negotiate, or to force it to bow to mounting pressure by closing its borders. This already took place amid the Iraqi Foreign Ministry’s call on Turkey and Iran to only deal with the central government on border ports and on oil matters, and also asking them to close all ports with Kurdistan until they come under the control of the Iraqi government. The common menace of an independent Kurdistan brought Iran and Turkey on the same track, providing both countries with a chance to coordinate and decide on how to confront the new status. On 4 October 2017, Turkish President Recep Tayyip Erdoğan visited Iran to discuss issues of mutual interests – and the Kurdish issue was very high on the list. Both Erdoğan and his host, President Hassan Rouhani, expressed dismay toward the Iraqi Kurdish state. While Rouhani said at a joint news conference, “we will not accept changing borders in the region,” Erdoğan warned, “a development of this sort will isolate the Kurdish regional government.” He added, “from this moment onward, more decisive steps will be taken.” Both countries are concerned that the referendum will have dire consequences for the future of Iraq and for the status of Kurdish minorities in neighboring countries, including Turkey and Iran. As for Iraq, having a Kurdish state could prompt Sunnis in Iraq to call for a similar referendum of their own, thus Iraq would cease to exist and would be replaced by three “shaky” sectarian or ethnic states. The Kurdish domino effect could affect the stability of Turkey and Iran and would pose serious risks to their national security. The rapprochement over this issue relatively restored trust between Ankara and Tehran that was gradually lost due to the differences over the fate of Assad in Syria. While it is true that Erdoğan did not give up his position on Assad, it is also clear that aside from the fate of the Syrian president, both countries – along with Russia and thanks to the intersection of interests – are working on new dynamics regarding the Syrian crisis, proving once again that a threat in Iraq could be transformed into an opportunity in neighboring Syria and vis-à-vis. The revival of the Turkish-Iranian regional alliance could create a new reality in the Middle East, and might limit the level of sectarian hostility given both nations’ influence over main walks of Sunni and Shia Islam. Given its military, political, media, and social effect, such an alliance would not only be effective in the war on ISIS and extremism, but would also limit the possibilities of foreign – political or military – interference in regional crises. It would also pave the way for understandings that could rid the region from bloody strives. Gul-Ali Babayi, Letters of the Fish (Tehran: Bisto Haft Besat Publishing, 2015), p. 433. 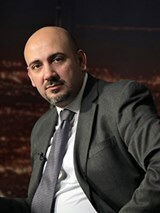 Ali Hashem is a columnist for Al-Monitor and Iran Bureau Chief for Pan-Arab news network, Al-Mayadeen.